It was a hat-trick for Britain’s Emma Wilson who took Silver in the women’s RS:X European Championship, third in the Open Championship and the Under21 European title. Lilian De Gues of Holland is the 2019 women’s RS:X European and Open Champion, in the Open event Yunxiu Lu of China was second, and Wilson third. 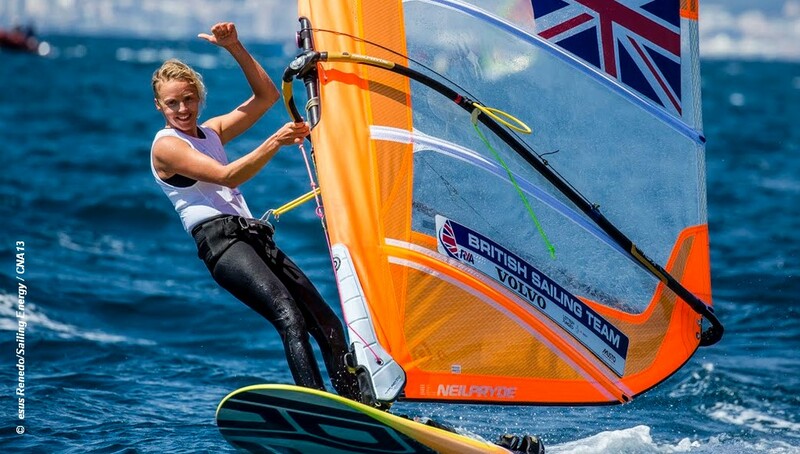 In the RS:X European Championship Wilson took second and Charline Picon of France was third. Wilson finished third in the Medal Race, which was won by De Gues, and with Picon dropping down in ninth was able to overtake her to claim second overall. In the men’s RS:X European Championship Kiran Badloe of Holland is the 2019 champion, with silver to Dorian van Rijsselberge also Holland, and Thomas Goyard of France third. The men’s Under21 RS:X European title went to Yoav Cohen of Israel. Britain’s Andy Brown placed third. In the men’s RS:X Youth European Championship Fabien Pianazza of France is the 2019 champion, silver went to Nicolo Renna of Italy and bronze Yun Pouliquen of France. The Under17 champion is Daniel Basik Tashtash of Israel. In the women’s RS:X Youth European Championship Naama Gazit of Israel is the 2019 champion, silver went to Linoy Geva of Israel, and bronze to Heloise Macquaert of France. The Under17 champion is Manon Pianazza of France.